Provide comfort for the family of Marilyn McMullen with a meaningful gesture of sympathy. Passed away at home on Wednesday, February 6, 2019. 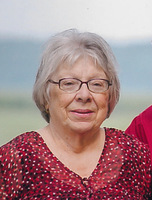 Marilyn Loraine (Dixon) McMullen, at the age of 76 years. Beloved wife of Ralph McMullen and cherished mother of Teresa McLennan (Rod). She will be sadly missed by her grandchildren Andrew, Brendan, Robert and Alison and by her great grandchildren Hannah, Madeline, Jillian Jo and Sam. Predeceased by parents Winnifred Patterson and Walter Dixon, and by her siblings Margaret Fox, Frank and Gary Dixon. Marilyn will be fondly remembered for her dedication to the community through her work with the Royal Canadian Legion. Her involvement includes the Legion Minor Baseball where she was the secretary for the Canadian Little League Championships in 1985, Youth Education, Remembrance Day Posters, Essay and Public Speaking contests as well as serving as a member of the Executive over the years. Family and friends are invited to pay their respects at Irvine Funeral Home and Chapel, 4 James Street East, Brockville, Saturday, February 9, 2019 from 11 am until 1 pm. A Royal Canadian Legion Memorial Tribute and funeral service will take place in the chapel commencing at 1 pm. A reception will follow at the Brockville Legion, Br. 96, 180 Park St.
As expressions of sympathy, donations to the Legion Poppy Fund or the Heart and Stroke Foundation will be gratefully acknowledged. Send condolences or make a donation online at www.irvinememorial.com. A Royal Canadian Legion Memorial Tribute and Funeral Service will take place in the funeral home chapel commencing at 1 pm on Saturday followed by a reception at the Legion, 180 Park Street. Brendan, Laura, Hannah and Madeline xoxo sent flowers to the family of Marilyn Loraine McMullen (Dixon). Ralph. I was shocked and deeply saddened to read of Marilyn's passing. My thoughts and prayers are with you. Ralph, we're sorry for your loss. Our thoughts and prayers are with you and your family. So very sorry to hear about your loss of Marilyn. Our thoughts and prayers are with you Ralph, Teresa and family. I would be there today with you but I had to work today. God be with you all and with Marilyn. Ralph, my deepest condolences to you and your family. I'm so sorry to hear of Marilyn's passing. You're in my heart and in my prayers. RIP Marilyn. You will be missed.